Table saws come in all sizes. Some are meant for experienced users. Others are suitable for beginners and seasoned users alike. The best table saw for a beginner is easy to use, has safety features, and is easy to maintain. 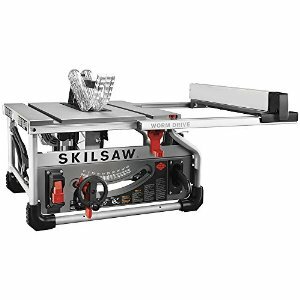 For a weekend project, the SKILSAW SPT70WT-01 10″ Portable Worm Drive Table Saw is an excellent choice. Read on for a review of this table saw. What Makes This a Great Beginners Table Saw? Light weight. The saw and table weight 49 pounds, so it can be moved to different work locations or transported, if necessary. The saw folds into the frame, for easier loading and unloading. brass gear worm drive. Provides maximum power for smaller and larger jobs. 3 1/2 inch cut depth. This makes it useful for a variety of cutting jobs and wood thicknesses, including posts and 4x4s. Buyers say the blade rips posts and thick wood with ease. Self aligning rip fence, to provide a straighter cut. Users claim the cuts are as straight and smooth as from a factory. They also say the rip fence stays in place, even under greater pressure. 180 day money back guarantee. If not satisfied, the saw can be returned within 180 days, for a full refund. The table extends to 4 ft. This is a great feature for cutting longer pieces. It’s handy on a job site, as the table then folds to be put away for hauling. Handy tool holder. This allows users to keep gauges and other instruments for measurement handy. Low vibration. Users say they don’t have to worry about jumping or bouncing during the cutting process. Needs adjustment out of the box. Buyers say they needed to spend some time adjusting the saw rip guard and blade height. blade guard handle is difficult to operate. It takes more than an average amount of force to lock the guard. Many parts of cast aluminum. Though some users say the saw is built like those with a reputation for high quality, others believe the parts are cheap and will warp quickly, with regular or occasional use. Some saws come with a cheap Skil blade. Many people have purchased the saw because it claims to come with a higher quality Dewalt blade. blade designed for rough cuts. The Diablo blade that comes with the saw is for rough cutting. Buyers should purchase a finer blade, if they want a smoother finish on the wood. The fence does not align with the blade. Some users have tried to remedy this situation, by adjusting the fence, to no avail. Users should make sure the blade and fence are adjusted and square, prior to use. This SKIL saw is ideal for many smaller projects at home or on the job site. It does require some adjustment, but the guide does a good job of explaining what to do. It’s light weight and portability make it suitable for a variety of jobs away from home, as well as at home. The table extension allows users to cut larger pieces of wood easily.